The Department of Homeland Security (DHS) describes the U.S.-Mexico border as more secure than ever, and the estimated stock of unauthorized immigrants in the United States has fallen by more than 1 million in recent years. Despite that, some national politicians, members of Congress, and others continue to view the Southwest border as out of control, and insist that the United States should consider broader reforms to the U.S. immigration system only after the border has been secured. 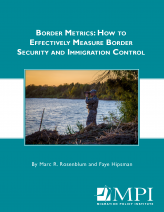 The absence of timely, reliable, and publicly trusted indicators of immigration control represents a fundamental challenge to resolving this public debate and definitively establishing the degree of effectiveness of border enforcement. Without such metrics, basic questions about changes in immigration flows and the effectiveness of policies and programs cannot be authoritatively answered, and Congress and DHS have difficulty evaluating existing policies and programs or make informed choices about the costs and benefits of current and potential investments. This report identifies four key questions about border security and immigration control. Taken together, the questions provide a full accounting of illegal immigration levels and modes of entry, and accurate answers to these questions would provide a comprehensive accounting of illegal immigration flows. The report also describes what methods and metrics already exist to answer these key questions, as well as the strengths and limitations of existing approaches, and how they could be improved. A. How Many Unauthorized Immigrants Enter Between Ports of Entry? B. How Many Unauthorized Immigrants Enter Through Ports of Entry? C. How Many People Overstay Temporary, Nonimmigrant Visas? D. How Many Unauthorized Immigrants Live in the United States?